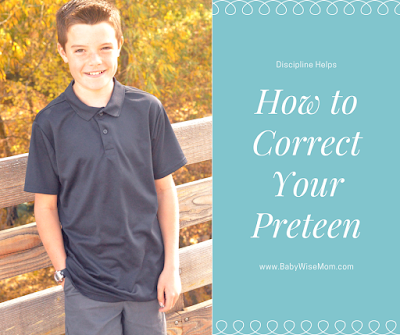 As soon as your child enters the age for a preteen, the way you correct or discipline that child starts to shift a bit. You both can feel things changing, but neither of you are quite sure how that should be, much less how it will be. A child in the middle years age-range certainly knows a lot more about how to behave than a two year old. Just because your preteen knows more than she did when she was younger does not mean she knows everything. She will still do things she shouldn’t and will still need to be corrected. A middle-years child very much still needs to be taught, encouraged, and disciplined to learn how to grow into a wise, moral, and responsible person. One of the most annoying aspects of being a preteen when I was growing up was the onslaught of comments about my upcoming teen years. I was a responsible, obedient, and respectful child. People would often comment on those traits and add, “You won’t be a terrible teenager, will you?” Or ” You are sweet now, but wait until you are a teenager!” I always felt frustrated by these comments. Even at that age, I felt like being a teenager didn’t mean I would be a rebellious sass. While I had my share of sassy moments as a teen, I did indeed maintain my identity as a responsible, reliable, and respectful person even while I was a teenager. The preteen years are usually quite smooth sailing. You have spent time correcting your child as a toddler and preschooler. As she has grown, she has become easier and easier to parent, with less correcting. It is easy to sit back and live life on autopilot. It is important, however, to continue the thought process you had when your little one was a baby, “Begin as you mean to go on.” Prevention first is still an appropriate mantra. The need for discipline may be minimal in this age group. Do not let that drive you to be passive and avoid correcting your preteen. As I mentioned, you both sense something is shifting. It is like you are sitting in paradise, but you feel little gusts of wind blow in every once in a while. Now is the time to prepare for a storm moving in, not to take a nap. Teenagers don’t have to be insane monsters, but hormones kick in and things do change. A common line you will hear from your preteen aged child who has done something wrong is, “I didn’t know!” There will be times you know with certainty that the statement is true, and times you will know it is false. A large part of parenting at any age is understanding the difference between Childishness and Foolishness and knowing how to react in the two instances. You can read my post to get the full information, but basically childishness is your child simply not knowing the correct way to respond or behave in a situation. Foolishness is your child choosing to do the wrong thing. No matter if the behavior was childish or foolish, correction needs to happen. The motives behind the action impact exactly how the correction takes place. Correction in the preteen years can be a fragile thing. Your relationship has started to shift. While you could declare your child do things “because you said so” in younger years, that isn’t the best approach in preteen years as you head to the teenage realm. You want to be teaching why. You are moving from leading your child to guiding, or training, your child. Here are some tips for correcting your preteen. This post contains affiliate links. If you are constantly needing to correct the same behavior, something isn’t working. Correction and discipline should lead to change. If your preteen isn’t changing and improving, you need to reevaluate the situation. Are you giving too many chances? Is your discipline too harsh or too lenient? Again, discipline is not effective if your child doesn’t learn from it and leave with the understanding and motivation to try harder next time. If your child doesn’t understand why what she did was wrong, discipline was ineffective. I have discussed this in the post Teach What is Right, not Just What is Wrong. You don’t just correct behavior, but you tell your child what she should be doing, instead. “If all you do is describe bad behavior, the only thing your child has a mental image of is bad behavior” (On Becoming Preteen Wise, page 104). 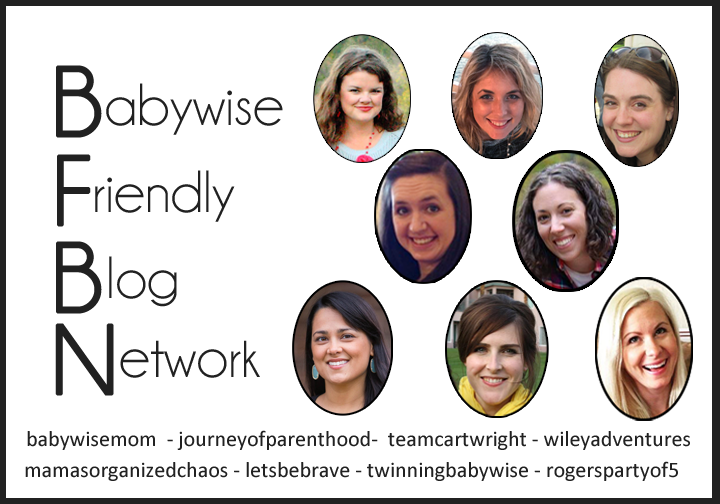 We often look at something our child is doing wrong and want to just stop the behavior. We instruct our child to not do that now or ever again. There is a more effective way to handle unwanted behavior, though. You teach the Virtue of the Vice. In other words, you teach the opposite of what your child is doing wrong. Let’s say your child is acting out because of jealousy. You can teach your child to be happy for others. No matter what issue your child is having, you can teach the flip side of that issue. It seems easy and straightforward on paper. Do not bail your child out–let her experience the consequences while she is young so she understands the reality of consequences when she is older. Sure! That makes sense. In reality, it is hard to let your little cutie experience consequences. While to you it is a small consequence, to her it is her world. You don’t want to allow your child to experience such heartache. You spend so much time and energy making sure she is safe and protected, and consequences are painful! You want to remove that pain. I have discussed the balance between teaching consequences and teaching grace in this post: Should You Bail Your Child Out? No one likes to be corrected. No one likes to be told they did something wrong. Figure out what works best for your child when you are correcting your child. Does she need an arm wrapped around her? Is it best if you go for a walk to talk about it? The Five Love Languages of Children is a great resource to help you get to know your child. Do not use love language against her, meaning, if her primary love language is physical touch, do not remove hugging from her when she is in trouble. Use the love language to help her feel you still love her as you are correcting her. Another great tool is triad communication. This can work for all children, but it is especially helpful for males (boys and men alike!). Basically, you and your child talk while you are doing something else–thus the “tri” in triad. This is referred to as indirect communication in On Becoming Preteen Wise (page 107). Girls do well with direct conversation. If you are a female, you can probably relate. When you are talking with someone and they do something else while you talk, you likely feel like they are not interested or not invested in the conversation. You feel better with eye contact and face-to-face communication. Not all males and females will fit into these two general preferences, but most will. Microrebellion is when your child partially obeys you or partially disobeys you. It is easy to look at those instances and think, “Close enough. I am tired of fighting this” and let it go. Insist on obedience. Even if it is micro, it is defiance and it is testing the waters. She is seeing how far she can push it. She will continue to test until she reaches your breaking point. You are still working on preventing issues. If you allow micro now, you will face much larger micros in the teen years. A preteen is going to have siblings in different stages of life unless she is the only child. Do not treat your preteen like a five year old in order to avoid your five year old getting upset. Do not treat your preteen like a teenager in order to have fewer rules and make things with the older sibling easier. Treat your child like an individual and give rules, consequences, and instructions accordingly. 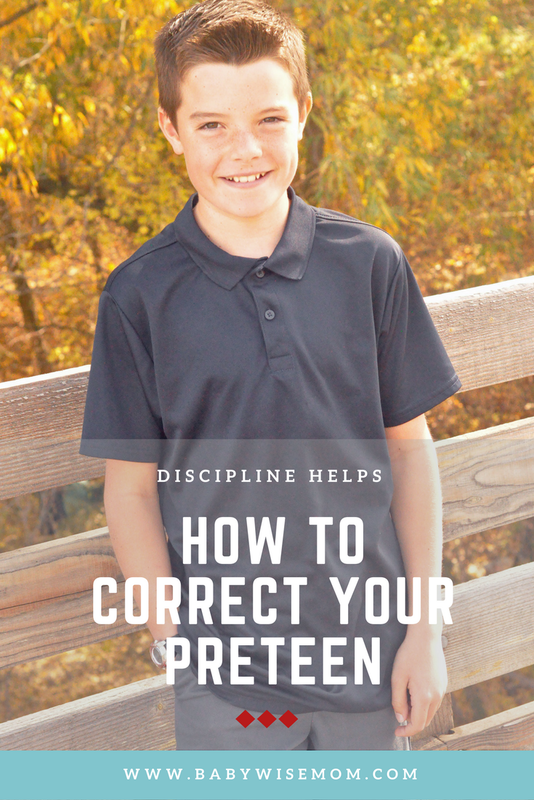 These eight tips can help guide you in your need to correct your preteen. Remember, it is easy to let things slide in this age and ignore the need to correct, but you want to prevent major issues in the teenage years. Correct, teach virtue, and guide your child through these preteen years. You can feel those gusts of wind and use them to propel you further so you are well-prepared to meet the teenage years when they come. microrebellion is a hard one for us- love all of your tips! My 11 year old twin girls are kind of opposites when it comes to parenting and the "harder" one is giving me a run for the money sometimes. Gotta think outside my normal box with her! That has got to be tricky to have two the same age you have to parent differently! You are so welcome!